This modern tapestry "The First Kiss" is inspired by William Bouguereau's "Cupid and Psyche" depicted as Children (1890), and portrays these characters in a style inspired by Gustav Klimt (1862-1918). The original is a painting by Bouguereau of these two mythological characters kissing. The story is that Venus was envious of the beauty of a mortal girl Psyche, and so she asks her son Cupid to go down to earth so that when she awoken from her sleep she would fall in love with a vile creature. However Cupid scratches himself with his arrow and falls in love with Psyche. In this work we see the style of Klimt with his love of patterns and color to portray this work in new style. 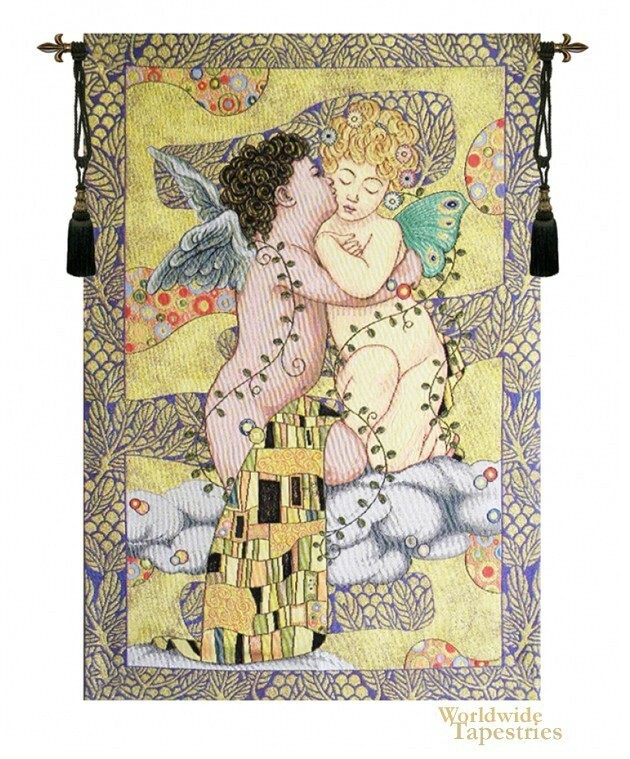 This modern art tapestry "The First Kiss" is backed with lining and tunnel for easy hanging. Note: tapestry rod and tassels, where pictured, are not included. Dimensions: W 24" x H 36"